1.In a large pan on medium heat, add pancetta and render until crispy, about 10 minutes. Remove from pan and set aside on paper towel lined plate. 2.In a food processor, pulse the cauliflower florets 8 to 10 times, until it resembles small grains of rice. 3.Clean then pan, and heat the olive oil in a large skillet over medium heat. Add the garlic and cook, about 4 minutes. 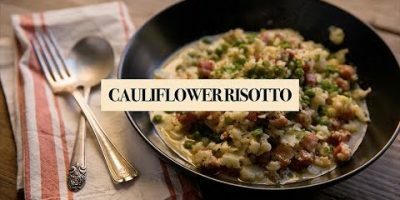 4.Add the cauliflower, vegetable stock and cook until the cauliflower is softened and enough liquid has evaporated to make the mixture creamy, about 10 minutes. Season with salt and pepper. 5.Stir in the Parmesan, butter and let sit 5 minutes to thicken. Finish by stirring in the pancetta, peas, chives, and parley. Add a touch of water if mixture becomes too thick.